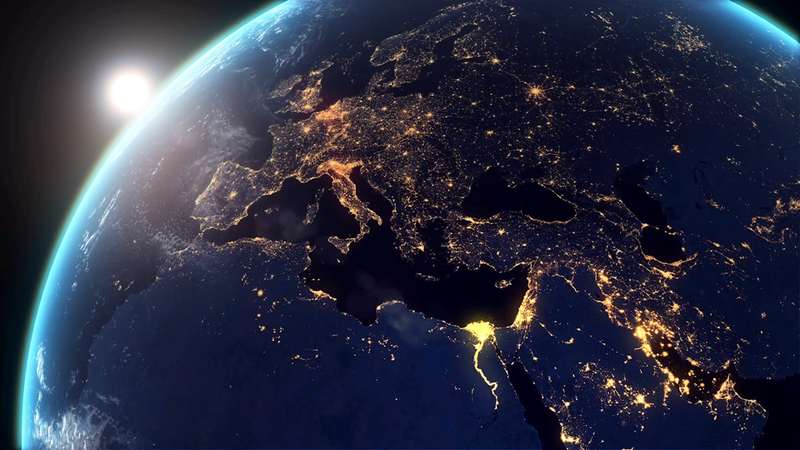 Around the world, energy grids are undergoing the biggest transformation in a century. Energy efficiency and sustainability have become chief concerns for enterprises as they prepare for a low-carbon future. The cost of technology continues to decline rapidly while computing, storage, and bandwidth capabilities are improving exponentially. Tiny, low-cost, high-powered, and communication-enabled sensors are becoming embedded in everything around us, which leads to ever-increasing asset interconnectivity as the Internet of Things expands. When it comes to energy, the combination of emerging innovations that produce, transmit, and consume energy all add up to one big change: decentralization. Decentralization is the transformation of the “one-way street” of energy into a multi-directional, multi-lane highway. 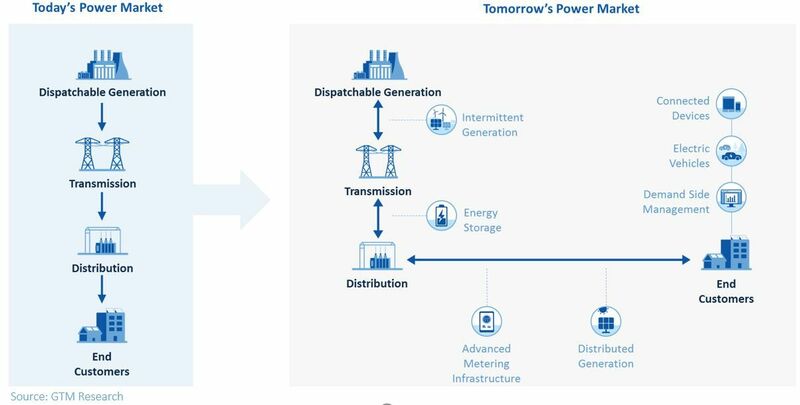 Centralized power generation is increasingly giving way to decentralized as new technologies continue to allow for different forms of power generation, storage, and transmission. This means that the grid as we know it — and everything related to it — is changing rapidly. Decentralization is nothing less than a revolution in how we generate, store, move, and consume energy. In a traditional centralized energy grid, energy producers, transmission and distribution operators, and suppliers work together to bring electricity to consumers. But advances in renewable energy and distributed energy resources, IoT connected devices, and peer-to-peer networks are reshaping that paradigm dramatically. In 2016, renewable energy sources contributed more than 30% to total global installed power generating capacity. We already see consumers in many industries demanding more control. Online buyers, for example, can both buy and sell products online, often on the same platform. In the new energy landscape, energy-consuming devices will, in many cases, become assets capable of storing and redistributing energy as needed. For those of us who now merely consume energy, whether in our homes or businesses, decentralization means we’ll become more and more involved in energy production and storage as well. We will evolve from one-way energy consumers to multi-directional energy prosumers. Consider a hypothetical example using solar energy. Prosumers could install meters with sensors and smart technology. These smart meters measure energy from the solar grid and send information about energy production, consumption, and excess energy to a mobile app. The informed prosumer then sells the surplus to the consumer market via an online trading platform. The transaction would be fully automated based on smart contracts, and a block chain-based network records the sales. The power grid (assisted, perhaps, by forward-thinking utilities) delivers the purchased energy to consumers or other prosumers. Using blockchain, it’s possible to envision a decentralized energy grid that facilitates the production, distribution, and marketing of renewable energy by local homeowners. Operating in a decentralized future, every large organization will need to become an energy company, capable of producing, storing, and selling energy on a real-time basis. This will bring both complexity and many new financial opportunities. Companies that have the generation, storage, and IoT devices necessary to participate will be able to open up new revenue streams by selling excess energy to their peers. On the other hand, this will also require either on-site or outsourced staff to manage energy in this new, dynamic environment. Decentralization means consumers and businesses alike will continue to gain new opportunities and, further, utilities themselves will be presented with the opportunity to evolve into something new, to become facilitators of and in the new world of energy. For power utilities, decentralization presents an enormous opportunity. As a key player in established, centralized grids, utilities contain much of the expertise required to facilitate the transition from uni-directional power flow of today to the multi-directional flow of tomorrow. Some of the largest U.S. energy companies are investing in a decentralized future. 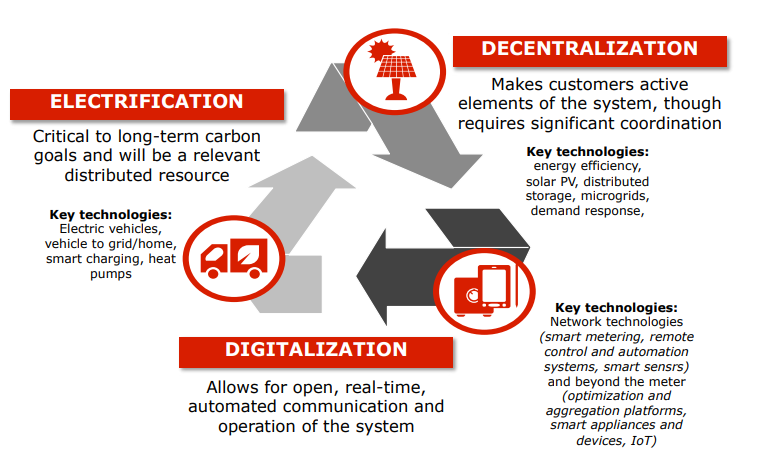 The way for utilities to face the challenges — and capitalize on all the opportunities —presented by decentralization is through their own digital transformation. What’s on other side of decentralization? Where is this revolution leading? All of the specifics aren’t yet clear, but the resulting future of the energy grid — the end product of decentralization — is what we call the MeshGrid™ ecosystem. The MeshGrid ecosystem will web together the physical and virtual world, allowing energy generation, storage, and consumption to be optimized continuously through automation. The foundation of this ecosystem is already being set in place through the advent of technology enabling networked microgrids and nanogrids capable of producing, using, and storing energy and transacting energy with others. While a fully realized and active MeshGrid is still in the future, decentralization is already here — and it is only accelerating. Like any revolution, decentralization is disruptive, confronting all of us with new challenges and presenting us with new and very large opportunities. Companies and utilities that embrace decentralization today and prepare for the coming MeshGrid ecosystem will have a strong advantage both now and in the future.